Steven Harts is just getting started! In a musical career that has spanned over two decades, Steven Harts started his professional musical journey as one of the lead men for the 90's platinum-selling group Troop. 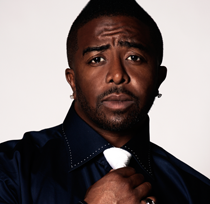 Steven has remained relevant and in demand from today's music industry elite to budding new artist by creating and taking part in remarkable hit records such as Jordin Sparks' Grammy nominated "No Air", Chris Brown's Grammy nominated "Take You Down", and 2009 Grammy winner Jennifer Hudson's debut CD titled "Jennifer Hudson". Singer, songwriter, producer and vocal arranger, Steven Harts has personified the essence of song making and has spawned hits that will continue to influence generations to come. Steve was born in Hartford, Connecticut as Steven Russell and raised in Pasadena, California. As a teen, Steven would spend countless hours in front of the television watching and mocking the musical and dance styling of his most admired artist - Michael Jackson. Having aspirations of being the next phenomenon, Steven would wow crowds at Los Angele's renowned Venice Beach by displaying his undeniable talents of singing and dancing. Often drawing crowds of hundreds to watch him perform, Steven predicted that by the time he was 18 he would have a #1 record playing on the radio. Well, Steven would fulfill his prophecy far beyond his expectations by winning a talent show with childhood friends Allen McNeil, Rodney Benford, John Harreld and Reggie Warren that sparked interest from major record labels. Signing to Atlantic Records, these childhood friends from Pasadena would be known to the world as Troop. Troop released their debut single, "Mamacita", from their self-titled debut album in 1988 that reached #2 on Billboard's R&B charts. After the release of their debut album, Troop released "Attitude" in 1990, which included such hit songs as "Spread My Wings" and the Jackson 5 cover of "All I Do is Think of You", which were both #1 on the Billboard R&B charts and remained in the top 10 on the charts for several weeks. At the height of Troop's success, the group appeared in the 1991 urban classic film New Jack City harmonizing their rendition of the O'Jays, "For the Love of Money/Living for the City". Following a stream of hits and an enormous fan base, Troop released "Deepa" in 1992 and remained consistent with yet another #1 single, "Sweet November", on the Billboard R&B charts. Two more albums would follow... "A Lil Sumpin' Sumpin'" in 1994 and "Mayday" in 1998 which both received rave reviews. After releasing "Mayday" in 1998, Troop took a hiatus and Steven began to redirect his focus on songwriting and producing. 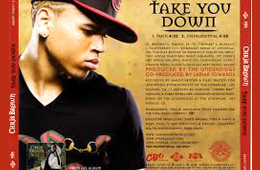 Acquiring much experience writing and producing with the likes of Babyface, Chuckii Booker and Gerald Levert while recording with Troop, as well as singing background vocals for Babyface's "Tender Lover" album as well as Keith Sweat's "Merry Go Round", Steven began what would be a long productive relationship with the Los Angeles based production team The Underdogs. As one of the main writers and producers for The Underdogs, Steven would writeand produce hit songs for artist like:, Aretha Franklin, Kelly Clarkson, Charlie Wilson, Jordin Sparks, Tyrese, Ruben Studdard, Fantasia, Mario, Omarion, B2K, Joe, Tank, Katherine McPhee. The Underdogs, along with Steve, undertook the task of being the sole production team to produce the soundtrack for the 2006 film adaptation of Dreamgirls, which Steven also had a cameo appearance in, as well as a song placement "A Perfect World". Proving he still had the ability to swoon audiences as he did with leading songs with Troop like "All I Do Is Think of You" and "Sweet November", Steven continues to reincarnate and refine his talents. 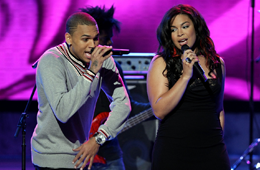 "No Air" sung by Chris Brown & Jordin Sparks, this tune was written by Steven Harts.